Prime Minister of Dominica and Minister responsible for Finance, Roosevelt Skerrit has responded to the call of the Leader of the Opposition Lennox Linton for an increase in the pension, stating that Linton’s proposal shows his ignorance of the country’s workings. Mr. Skerrit stated that this proposal shows citizens the opposition’s inability to properly manage the country’s finances. “Once again the Leader of the Opposition in his hastiness to oppose for opposing sake has proven to the people of Dominica, that he does not understand how to manage the finances of our country. His recent call for the increase in the minimum pension rate shows that once again he has failed to analyze how much work we are doing as a country to rebuild after Hurricane Maria,” he stated. He noted that if a pension increase is given, it will hinder the current development of the country, as well as impact the pension of future pensioners. Mr. Skerrit went on to state that before an increase can be made, its future effects must be studied, adding that the proposal from the Opposition shows his misunderstanding of the system. “We must not forget as a country that it is the very same UWP which almost bankrupted the DSS by not remitting to the DSS due to it by law, and also the mismanagement of investments by the DSS proposed by the UWP at the time,” Mr. Skerrit added. Mr. Skerrit further added that these statements and plans form the opposition show that neither he nor his team are aware of the future impacts of this suggestion. “The leader of the Opposition’s lack of a feasible ideology and vision of Dominica is clear. 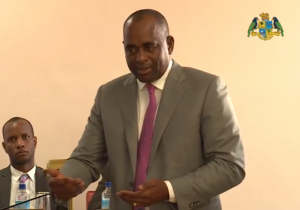 His utterances prove that neither he nor his advisors have assessed the projected trends of aging in Dominica, and the impact that this proposal will have on them in five ten twenty and twenty five years,” Mr. Skerrit added.